OK you may not like the guy but this is a great sounding overdrive/distortion pedal. A modded and souped up Boss SD1 with no output buffer. I've added a clipping switch that will allow you to switch between the stock 3 diode asymmetrical arrangement, and a second arrangement of your choice. 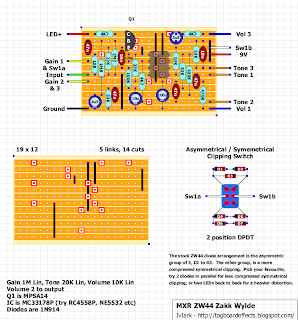 I've included 4 diodes to give a more compressed symmetrical clipping but put in there whatever you like, germaniums, schottky, LEDs, MOSFETS etc. I really like this pedal and have an original but will probably still build this up at some point anyway for the extra clipping options and because I hate the fact that the crappy bypass on the original meant that your signal chain was permanently connected to the effect input. Tsk! Gain pot is reversed. Swapped that, and it's ok.
For a second i though about putting my Sonic Distrotion for sale... But then i found out that it was just a solder bridge. :) This is just ok sounding medium gain od/distortion. Needs to be played loud for chance of any real creaminess. If someone is not a fan of ZW, i'd really recommend Ibanez Sonic Distortion to build instead of this. This is not bad, but i think i was a bit disappointed. Hey Mirosol, Have you tried in front of a dirty amp? thats when it shines (in my opinion) I prefer this to the Ts9.. A little less mid honk if you get what I mean. 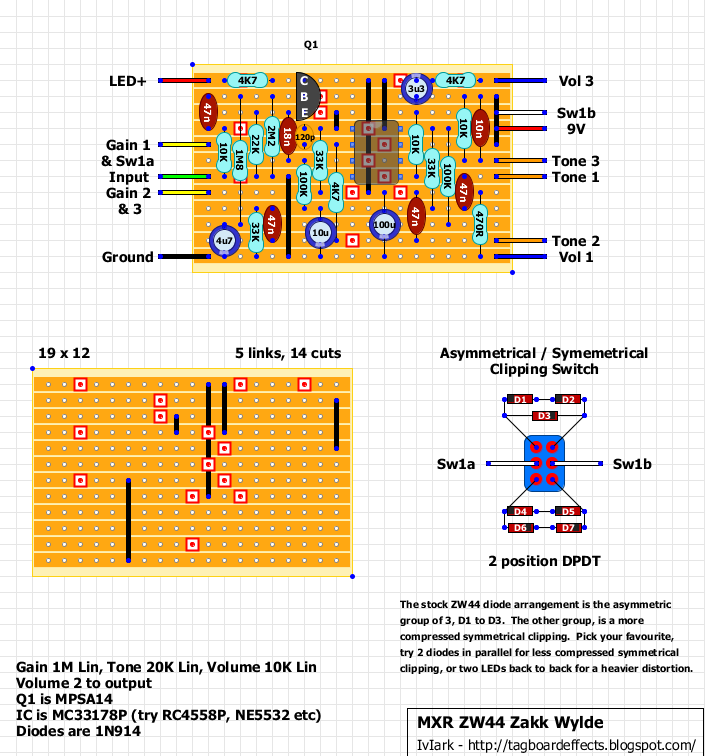 I just built Wampler's Plexi Drive with J201s week or two ago, and if compared, ZW44 is quite useless. Not saying that ZW44 is no good, just that i may have expected too much. Although, Plexi Drive is more overdrive than distortion, if you ask me. Still looking for perfect overly dirty distortion... Best so far is probably that Ibanez/Maxon Sonic Distortion (SD9). That is, in my opinion, saddly undervalued. Well. Next dist-build is probably BJB/MP Stone Grey.. Thanks for the tip Vince! I want to build the Wampler, Theres so many that I get lost and can't remember what I'm doing next lol... I want to try the SD9 too! I'll get there soon...The Stone grey sounds nice too. I just made a single pedal with two Wampler Plexidrives and I LOVE IT! I don't know if you're talking about that one but I'm guessing. I use one side for low-gain crunch and the other for medium-gain drive. Combining both makes them fat and nice! I made the Stone Grey the other day and I was a bit underwhelmed. Don't get me wrong, it's very good! It's just not the sound I'm after personally. Could Suhr Riot be better than ZW44 or Stone grey? Thanks for verifying this one mirosol and the pics. Geiri did you make the Plexidrive with the layout on here? I admit that i built plexidrive from other layout. Had the board waiting to be boxed for a couple of months. Finding perfect set of J201s was also pretty painful... But worth the effort nevertheless. Im guessing if i put a 15nf and a 3nf in the same holes will do it ??? 18n is a standard value, but not as popular as some others. I bet that 22n would work just as well, if you don't want to solder caps in parallel. A newbie question about the "Led+" wire : If I want to build this one with a millenium bypass, can I use this wire to drive the millenium? I'm afraid the resistor would lower too much the power... I guess the best way is to forget this "led +". Right? I think rotating it 360 degrees won’t do much difference. Just recently started building (at least trying to build) pedals and there is one thing i couldnt figure out here, what is the LED+ and how am i supposed to wire it off board? And is it a 3MM Red LED or something else? Hey Ali. The LED+ is the positive leg of the LED. The size of that LED doesn't mater as it's just the indicator LED for the pedal being on. If you click on the top where it says "offboard" you'll see how to wire up the pedal to th switch. The only thing different is the indicator LED for this pedal has the attachment to the board rather than to the DC jack. I would highly suggest if your starting out to build something less complicated than this, as the more components on the board the more likely there is for something to go wrong. Also, I would read the build guide, tab at the top, first before building anything. Thanks for your answer. I thought of that LED as another one which is not the usual offboard led that goes into the 3PDT. Complicated layouts are not the actual problem for me, but the unclear offboard connections of these LED's were. Thanks again. There's some tricks to increase the gain of the Tube Screamer you could use with this circuit. Well, the Gain pot is already 1M, as well the 4 diodes clipping. Change the 4k7/0.047uF attached to pin 2 of the opamp to 2k4/0.1uF. I guess this comes from Keeley. Just beware the amoung of hiss and noise. In case of squealing you could increase the 120pF, but it is already more than double than the Tube Screamer. I don't know how much difference could do the opamp, I never try neither this, but perhaps a 4559D can make the sound beefy. A drastic mod will be the adding of a hard clipping diodes somewhere. I don't know how much this is possibile. I hope I helped you or even just give you some ideas. Thank to you for confirming this tips. The op-amp usually gives just a little slightly difference in the amount of gain and in the frequency. Indeed the layout give you a pair of suggestions as well the original IC. I suggest the TL072, too. I don't know what op amp you used, but I'm pretty sure that your pedal sounds just good enough. Of course you could make some experiment just for your curiosity.